The European gas industry puts a positive spin on the EU’s “decarbonisation agenda”. It sees a new role for itself as provider of “renewable” gas. But Professor Jonathan Stern notes that the potential of alternative gases is limited. Unless quick and decisive action is taken, the gas industry – network operators in particular – faces an existential threat. No one can accuse Professor Jonathan Stern of being anti-natural gas. As founder (in 2003) and long-time Director (until 2011) of the prestigious Natural Gas Research Programme of the Oxford Institute for Energy Studies (OIES), and author of countless articles and books on gas, he has always been intimately involved in the international gas industry. Yet he has also stubbornly refused to become a mouthpiece for that same industry. The reputation of OIES is built on that independence. Lately – he has a free role now at OIES as Distinguished Senior Research Fellow – Stern has been taking an increasingly critical view of the future of the European gas sector. In 2017, he wrote two papers - The Future of Gas in Decarbonising European Energy Markets: the need for a new approach and Challenges to the Future of Gas: unburnable or unaffordable? – warning that the optimistic “gas-as-a-bridge-and-ideal-back-up for renewables” narrative of the European gas industry was being challenged by the decarbonisation objectives of the European Union. He published a third paper February 5, Narratives for natural gas in decarbonising European energy markets, in which he warns that the European industry will not only have to start developing a new “narrative”; it will also have to start taking real action to make that narrative come true. Actions, he adds, that are not profitable today – and may not be profitable for a long time to come. How does he arrive at this conclusion? Stern notes first of all that the “traditional” gas advocacy narrative of the gas industry – based on the benefits of coal-to-gas switching and using gas as backup for renewables – will not suffice beyond 2030. The use of gas does “result in early emission reductions”, but “these will not be sufficient to meet 2050 COP21 commitments”. Yet Stern feels that the gas industry is still largely taking a wait-and-see attitude. They are looking to policy-makers to put “technical, legal, fiscal and carbon price/tax frameworks in place”, he suggests, to help the industry develop decarbonised and renewable gas – rather than taking action themselves. “I do not hear the post-2030 issues being discussed at a high corporate level at international conferences,” Stern tells me. 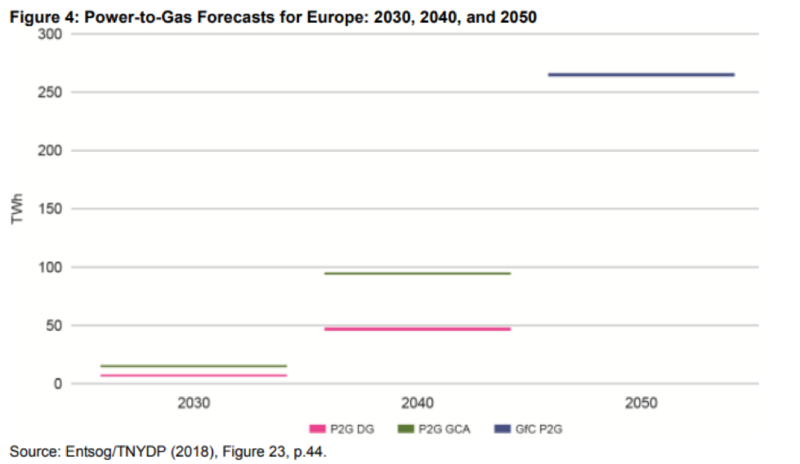 As Stern points out in his most recent paper, the truth is that the post-2030 future for European gas is far from clear and not as bright as the industry likes to project. 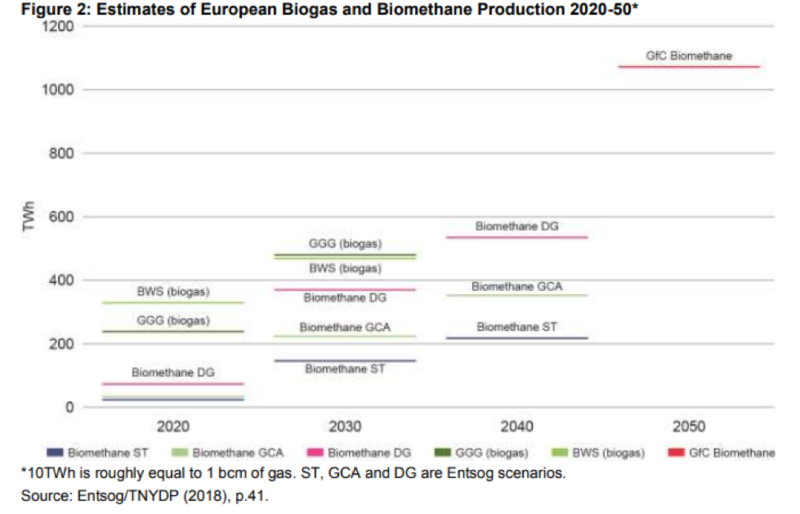 This figure makes it clear that, contrary to what Eurogas suggests, the “potential” of domestically produced biogas and biomethane is actually quite limited. Importing large amounts of biogas or biomethane hardly seems an option either. This leaves the third option: “blue hydrogen”, i.e. hydrogen made from natural gas through the process of methane reforming (SMR or ATR), combined with carbon capture and storage (CCS). And there’s the rub: blue hydrogen may sound good in theory but in practice very little is happening on the CCS front in Europe. There are some projects in the UK which have reached the feasibility study stage, such as the H21 project in the north of England, and one or two in the Netherlands, such as the Porthos project in Rotterdam and the Magnum power station, but these are all in their initial stages. No FIDs have been made on any of them. All of this makes the future of the European gas industry increasingly uncertain, according to Stern. Interestingly, he argues that the transition will be more of a threat to network companies (transmission and distribution) than to gas producers and suppliers. I had always assumed that network operators would have less to fear, since they could switch from transporting natural gas to other gases, whereas gas producers would go out of business if there was no demand anymore for natural gas.